Arizona Native Status: Introduced. This attractive wildflower is native to elsewhere in the United States, but some plants have become naturalized along roadsides in the Tucson area and likely in other urban areas here, probably due to the planting of wildflower seeds. Flowering Season: Summer. It blooms after the summer monsoon rains have begun. Description: The flowers are 1 1/2 inches (3.8 cm) wide and have 5 ruffled, rounded lobes and yellow-orange nectar guides in their throat. The 2 upper flower lobes are spotted with rust at their base. The flowers are followed by long, green, hairy, tapering fruits with a single curved "horn" that splits in half when dry to form 2 woody, wickedly sharp "claws". 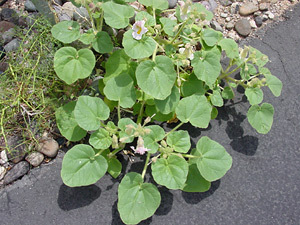 The leaves are green, hairy, and rounded to heart-shaped. The stems are thick, green, and hairy. The plants are covered in sticky hairs that can trap small insects and collect dust and bits of debris. 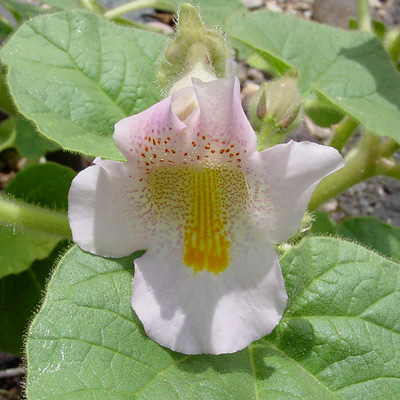 The similar Doubleclaw (Proboscidea parviflora) does not have rust-spotted upper flower lobes. Edible – Although slimy and bitter, the young, green fruits are edible and can be cooked, used as a thickener, or pickled. Foul-smelling – The sticky foliage has a foul, fetid smell.